Paradise Lost. Sethite Priesthood. Salt. The number one problem in identifying the location of the first Garden of Eden is the fact that the Biblical description is for the second garden between the Tigris and Euphrates. That was the garden that Adam and Eve made after they had to leave the first garden. The first garden was only occupied for about 100 years but the second garden lasted thousands. Adam lived for 530 years (930 years Gen 5:5) and Eve lived for 511 (Urantia Book p. 852) Some of Adam and Eve’s children continued to live in the second garden. Eventually the blood line ran out at about 2000 BC (UB 868) (which is within the time frame of Sumerian cuneiform writings). You have Adam and Eve arriving at the location for second garden right near where the rebellion had happened. Confusion is understandable regarding how events were remembered. Both located in Mesopotamia. Both involving a default of sorts. Most importantly both involving the gods and with a connection to the Tree of Life. Who would eventually record these events? The Sumerians who were the last of the Andites. The Garden was created by Van and his supporters for Adam and Eve who arrived at about 36,000 B.C. It would be here that Van would transplant the Tree of Life (as in the Sumerian tale about Enki and the Huluppu tree). At this time the strait of Gibraltar was still intact and it would stay that way for another four thousand years. There were inland lakes in the bed of the Mediterranean basin which was more elevated than today. It also allowed at that time of the last ice age an avenue to southern Europe and northern Africa. One such lake surrounded the Garden peninsula itself. We do not know what the exact shape of the Garden looked like except that it was a narrow peninsula surrounded by mountains and a great river flowed from Eden to the east. Where it ended up is ambiguous. The Urantia Book says it flowed "across the lowlands of Mesopotamia to the sea beyond." Whether that means to the Persian Gulf or across the Arabian landscape to the Arabian Sea directly is not answered. The Persian Gulf may not even have existed at that time. One theory has the Gulf filling with water at about 5,000 BC at an event-time called the Flandrian Transgression. (http://www.ldolphin.org/eden/) Another has the complete inundation by 7,000 BC. Even if the time frame was 17,000 BC it still would have been dry at the time of the first Eden. So "to the sea beyond" would be exactly that. No Persian Gulf only a dry basin leading to the Arabian Sea. According to the Book the Garden was a place of variety and botanical beauty. "The site chosen for the Garden was probably the most beautiful spot of its kind in all the world, and the climate was then ideal." (UB 823) It was the first choice of three locations. So where was the first garden exactly? If you would ask the average Urantia Book reader he would probably say Cyprus. It is a common assumption because it, on a first look, seems to resemble what the Book has to say. It is something I had accepted as well until a friend questioned this belief. And after looking much more closely as to what the Book actually says I have come to agree with my friend that Cyprus is not the location of the first Garden. This will come as a shock to some of my readers but I feel I have good reason to publish a new look for the location of the first Garden. Click on image to view. You may need to enable Quicktime. Please wait for animation to load. So to recap the animation, the three reasons for Cyprus not being Eden are: 1) Cyprus is still above water. 2) Cyprus is too far north for the river to flow across lower Mesopotamia and 3) Cyprus is not mentioned as the location. Two additional reasons are that Cyprus does not face directly eastward, it faces northeast and away from Mesopotamia. Lastly, at the time when the Garden was abandoned, the Nodites were travelling from the north, southwards towards the Garden. The original Levantine Nodite homeland did not extend into Anatolia but centered around today's Palestine and stretching just into Syria. (This point is addressed on the page The First Legend Introduction) Therefore Cyprus cannot be the location for the first Garden even if we wish it were so. During the time of the first Garden the bed of the Mediterranean was fairly dry and a large population lived there, some if not most were Nodites. The time line of today's geologists states that the Mediterranean went dry, was dessicated, during the period which is called the Messinian Event, a desert like condition, dated almost to six million years ago. That age lasted for a little less than a million years. Since the time of the Garden is Paleolithic it occurred during the last ice age and that means it was cooler, at least to the tundra of the north. The basin area would have been warmer and much more comfortable. "In the empty Mediterranean Basin the summertime temperatures would probably have been extremely high even during the coldest phase of any glacial era. Using the dry adiabatic lapse rate of around 10 °C (18 °F) per kilometer, a theoretical temperature of an area 4 kilometers (2.5 mi) below sea level would be about 40 °C (72 °F) warmer than the temperature at sea level." (http://en.wikipedia.org/wiki/Messinian_salinity_crisis). There are two assumptions by geologists for dates and temperatures. The first is that when the break at Gibraltar occurred it flooded the entire basin known as the Zanclean flood or deluge at 5.33 million years ago (mya) and second that the depth of the seabed was deeper than it really was. The seabed only became the level we know today because of the massive earthquake and volcanic activity after the time of the first Eden. But the important point is about the Messinian salt deposits which confirm the Urantia Book's statement that the Mediterranean had periods of being much dryer during its ancient history. Previous to the Zanclean flood there is suggested a repeated cycle of dry and flood eras but very much before the arrival of early man. Since that time the level of the Mediterranean may have fluctuated but has never been dry based on the assumption of the break of the sea wall of Gibraltar at such an early date. The discrepancy in dates between the accepted date by geologists of 5.33 mya and the Urantia Book's date of about 32 kya is about when Gibraltar gave way and thus the Mediterranean's final flood. The map below is my interpretation of available data. It is an overlapping of faults, volcanoes and stress. The main red fault line is between the African and Eurasian plate (of which the Anatolian plate is considered as part), large blue arrows are direction of plate movement and the red area around turkey is stress. The greatest stress is along the fault line between the future Aegean and Mediterranean Seas. This area is a vertical slip fault zone. The triangle that marks a volcano in the Aegean Sea is for Santorini (also known as Thera one of many locations for the legendary location of Atlantis) which, when it erupted, was the largest volcanic event in the last 10,000 years. The other two red triangles are for Etna and Vesuvius and the stars are where I consider the location for the epicenter of that major earthquake event. The Urantia Book uses the plural of volcano which is why I use three as an illustration. There were probably more considering the enormity and scope of this event. The geological history indicates that this area has by far the greatest seismic activity. When that event occurred the sea floor was driven downwards and at the same time the dam of Gibraltar broke and the Sicilian land bridge submerged both being affected by the fault line running through them. The area just southwest of Greece is known as the Ionian Sea and is the deepest part of the Mediterranean. The African plate is relentlessly moving into Europe. It will close Gibraltar again and collide with Europe at some point in the distant future. You can get an idea of how large the African plate is, running from a distance in the Atlantic west of Gibraltar to the Great Rift Valley between the African plate and the Arabian plate to the east. This should give you an understanding of how powerful these forces really are. What is not shown here are the faults of Italy which are extensive. Another consequence of the great land and sea bed displacement is the uplift of the rim of the eastern shoreline. It also slowly elevated the Anatolian plate to the point that it induced a change in the weather. Because of the higher elevation there was more precipitation in the highlands north of Mesopotamia creating an increasing amount of snow melt which combined with the greater rain fall contributed to the Sumerian "world wide" flood. So, if we go by what the Book says and the geology as we know it, then the peninsula lies off the southern coastline of Israel or the Gaza Strip. The more southern its location the more likely it is buried under the Nile Cone which is where sediments from the Nile Delta are deposited. The cone extends into the Mediterranean until it tapers off completely before reaching the Eratosthenes Seamount. Another reason for its disappearance could be that the violent earthquake which was big enough to break the land bridge at Gibraltar, lower the seabed and raise the rim of the basin would likely cause a lot of damage to the peninsula. The Urantia Book only says it slowly sank beneath the waters. It does not mention what the condition was of Eden. As for Cyprus it probably took its punishment too. The major fault line lies just south of it and another runs through the mountainous area on its northern edge. Its saving grace is the fact it is on a different tectonic plate. Its a very small plate, it would have moved. Most likely it rose up further as a result of the subduction of the African plate beneath it. If that is true then it was always an island unless it was a peninsula that broke off from the main land. But as a peninsula no matter where it was attached it still would have been in the wrong location to be the first Eden. It is simply too far north. The location of where the inland seas are positioned on the map above are partly referenced by the maps of the Messinian salt deposits and partly by what the Urantia Book alludes to. As for the size of the peninsula I think it is probably comparable to Cyprus or perhaps a bit smaller. In 2013 Cyprus had a population of 1.1 million. The Garden was meant to house 1.0 million. Both descriptions have surrounding mountains, a flat plain and surrounded by a sea but the Urantia Book would have Eden as narrow in shape. Starting at about 10 mya the African plate was moving due northward. Between the African plate and the Eurasian plate was the ancient Tethys Sea. It was the last of the great Tethys Ocean of Pangea and it was open to the Atlantic as well as the Indian Ocean. The passageway to the Indian Ocean was cut off by the Arabian plate and as the African plate continued to move northward it collided with the Iberian Peninsula and thus closing off the strait and the Mediterranean became an inland sea. This occurred at about 6 mya. This is the beginning of the Messinian Salinity Crisis which lasted until 5.33 mya. Geologists do know that there was a barrier between the western and eastern basins between Sicily and Africa due to the difference in water chemistry. During this time the Mediterranean may have gone completely dry or only partly dry. Over the intervening time period there were incursions of salt water. Then after roughly one million years the strait of Gilbraltar opened up again at 5.33 mya to reflood the Mediterranean to the current sea level. This break is at the beginning of the Pliocene. The break at Gibraltar is estimated at this early date because "5.33 Ma – abrupt synchronous return to full marine conditions. Miocene/ Pliocene boundary. (Krijgsman et al, 1999)" (http://www.ougseurope.org/index.php?id=28). Other data as well seems to point to an occurrence at this time of 5.33. As an example, biodiversity of amphibians such as frogs, salamanders and newts centers around this time. There are other indicators (such as a sharp delineation across core samples) that some type of monumental rise in sea level happened. According to some models (put forth on several web sites) the depth of the Mediterranean seabed was comparable to the Grand Canyon in Arizona in the US. That would be deeper than it was but not as deep as it became which is about twice as deep. There are also other computer models of a much higher seabed which reflect more closely the description from the Urantia Book. After a flooding at 5.33 the level of the Mediterranean may have never returned to the driest days of the Messinian. If that is the case then the later dryer periods would not be noticeable as being a part of numerous layers of fluctuation within the core samples. This would camouflage the total break after the time of the first Eden as just another rise in the sea level. Since we have sea water reaching the seabed of the Mediterranean at a time when it was clear Gibraltar was intact then some mechanism was involved in allowing that to happen. This means the Atlantic could have been lapping over the embankment of Gibraltar without having it to be compromised in any way. There are several other choices. One being oceanic levels driven by climate, another being tectonic forces that could have multiple origins such as volcanoes, lithosphere instabilities as in a subsidence of the seabed (a further lowering) or sea water that is not from the Atlantic. Gibraltar was strong enough to resist the pressure of the Atlantic but not the later violent activity of the tectonic plate fault that runs through it. This fault line may be the answer to the rise and fall of the isthmus given fault lines by their nature are unstable and periodic inflow could still have been catastrophic without a breach happening. Finally we should consider the Arabian plate which was tilted. Geologists know that the Arabian plate was submerged at some point in the past. But their estimated dates are too early to be considered by 5.33 mya. But that would be in error. The Arabian plate has had a history of bobbing and therefore allowing inundations from time to time. This periodic plate movement would answer two mysteries. The first is the difference between the two basins in water chemistry and where all that salt water came from. The cycle of flooding of the eastern basin suggests that the Sicilian land bridge was high enough to allow passage between Europe and Africa but had to have dipped down over its course to allow the waters from time to time to flow across it from the western basin to the eastern. It also may be tied to the phenomenon of the rise and fall of the isthmus thereby working in tandem. Although tectonic processes have been advanced as a reason for Gibraltar's failure, "no tectonic structure of this age has been unequivocally documented that could account for such a hypothesis... We show that such erosional process inevitably developed in the Gibraltar area. We finally propose that regressive fluvial erosion was at the origin of the opening of the Strait of Gibraltar." (Nicolas Loget, a, and Jean Van Den Driesschea aGéosciences Rennes, Université de Rennes 1, UMR 6118, Campus de Beaulieu, 35042 Rennes cedex, France. Available online 2 May 2006.) This theory would support the Urantia Book in that at 5.3 mya seismic activity did not breach Gibraltar. Another point to consider is about salt dessication, in that the added time per the Urantia Book elongates the dessication time frame by about five million years. And with a more shallow basin at a higher elevation it would more easily accommodate that time frame for repeated cycles of flood, even a large one, and evaporative cycles needed for multiple salts and differing layers to occur. If we further consider a higher level for the seabed then the depth of flooding would have been much shallower than today even if the sea and the ocean attained its equilibrium. The Urantia Book mentions the break of Gibraltar in association with the loss of life. The flooding at 5.33 mya would involve no loss of human life. It would be almost another four million years before humans appeared and perhaps is why the earlier flood is not mentioned. The Mediterannean Conundrum, that is what I call it and it refers to the discrepency in dates between the UB and today's science. The UB dates for the flooding of the Mediterranean and those proposed by today's scientists vary by a huge amount. When I first wrote my impressions on this history I did not take into account of the Arabian plate and its oscillations. I have since updated some of the above text. It is this sentence that may hold the key to the periodic floodings with their accompanying salt deposits on the Mediterranean sea bed: "They [the Badonan tribes of which these are pre-Sangik] observed the Mesopotamian peninsula gradually sinking into the ocean, and though it emerged several times, the traditions of these primative races grew up around the dangers of the sea and the fear of periodic engulfment." (UB 720) Originally the Tethys Sea called the Proto-Mediterranean connected with the Indian Ocean. Because of the depth of the salt layers science knows that over a period of time the Mediterranean would just about dry up only to be reflooded. The mechanism has been a mystery. They have been looking to Gibralter for the answer and so did I with the consideration that the fault line runs through the isthmus. It seemed the most probable location for sea water leakage. I did a 180 on this when I realized it is much more likely that the moving and bobbing Arabian plate that is the answer because it did not finally join with the African plate until about 400,000 years ago. Until that time it could have been letting periodic inundations into the eastern Mediterranean and thus large amounts of salt water. I recently ran across an article by chance on the Danakil Depression in Ethiopia. 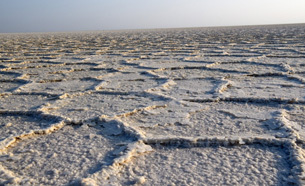 Since it is a vast salt plain I was interested in finding out if there was any information on how deep it is and how long it would take to produce a depth of salt of one mile (1.6 kilometers). What I discovered has a direct relationship with the Mediterranean Sea. I was totally unprepared for what I found. This part of Ethiopia is actually called a microplate and is located at the Afar triple junction. There is a rift between both the Nubia and Somalia plates and the fault running through the Red Sea that accounts for this microplate. It is very low lying in terms of geology and most likely will be at the forefront of global warming for submergence. Estimates vary from 1.5 miles/2.5 kilometers to 3 miles/5 km for depth of salt. "Some areas of the Danakil Basin are said to have between 2.5 and 5km thick salt layers deposited over millions of years while the area was connected to the Red Sea during periodic sea transgressions and flooding events." (http://earths-ends.com/the-geologists-nirvana-of-the-danakil-depression-part-1/) This is similar to the Mediterranean. The timeline for this deposition according to the article is "millions of years" which does not help much. I do not think at this point that we can get a reliable estimation of how long it takes to lay down these salt deposits and that comes, more or less, from the geologists themselves. The articles pertaining to the dynamics of plate tectonics are highly technical so I will not go into it here. 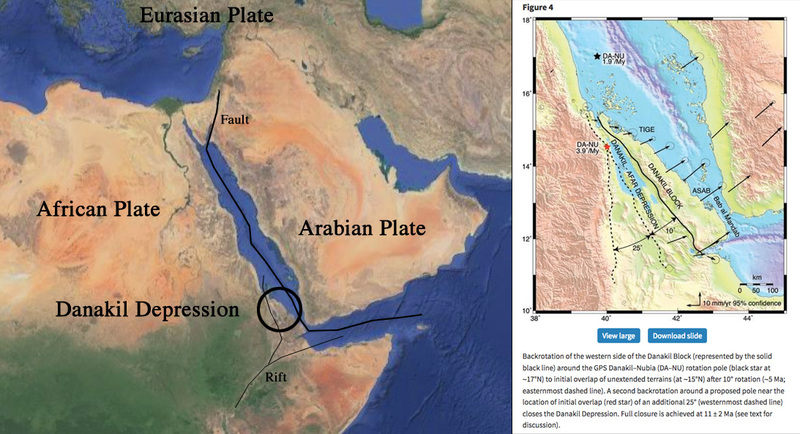 But the gist of this situation is that because the African, Eurasian and Arabian plates interact, both the Mediterranean and the Red Sea are affected by these huge tectonic forces all of which is not entirely understood. So, therefore, what happens between these plates will impact both the Mediterranean and consequently the Danakil Depression. But it is not only salt from sea water that created the Danakil salt flats. Supersaturated hydrothermal brines from hot springs also contribute to the salt deposition. But the classic view of salt evaporites is by solar evaporation. For us it does not matter which way the salts were laid down because geologist assume that these salt deposits in the Mediterranean and Red Sea occured approximately by the same geo/solar process. However, salt tectonics of evaporation is the convincing argument (Jackson and Hudec, Salt Tectonics: Principles and Practice, © 2017). That is, sea water inundation followed by solar evaporation seems to be the mechanism by which major salt deposition occurs. Oh yeah, and the first article goes on to say that, "The estimated date of the most recent sea transgression into the Danakil basin is around 30,000 years ago." Compare that with the Urantia Book's date of 32,000 years ago. See Here for map. After Adam and Eve left the peninsula they traveled eastward to what could have been the original location for the Garden but it was not the first choice. It was located between the Tigris and Euphrates rivers. If we refer to the Sumerian texts the Garden would have been on the eastern bank of the Euphrates side. It would be here that civilization was jump started again. It was one heritage of the Sumerians who would later build their cities to the south between the Tigris and Euphrates and to which the Sumerians referred to the northern plains as "Edin." It was because of the hard work of the Edenites in the second garden that civilization really had a chance to take hold. The incredible length of time over which this process took place demonstrates how difficult it must have been. Practically nothing survived the rebellion. "Only the Nodites and Amadonites was there persistence of the traditions of Dalamatia and the culture of the Planetary Prince." (UB 821). Adam and Eve had to build from the ground up. And that implies that the "Gift of Civilization" is mainly Edenic. We owe Adam and Eve and their family with all that they accomplished our deep and abiding gratitude. Many of the arts of civilization would have their origin here. Animal husbandry and agriculture which the Bible also supports were part of the Garden's culture. The Urantia Book adds more to the list including pottery, weaving and metalworking for some of the physical aspects, sanitation, writing and art as intellectual developments and civil administration, educational methods and religious devotions as part of their high culture. It is no secret that the Sumerians claimed that civilization was a gift from the gods. The Sumerians would have us believe it goes all the way back to Dalamatia. Unfortunately, any gains of civilization for the common man were lost due to the rebellion which ended in failure. But for the Nodites, the Nephilim, there was that "persistence of the traditions of Dalamatia." The centers for the repository for this knowledege could have been ancient Susa and southern Sumeria. The job of reintroducing civilization was one of many that Adam and Eve worked at implementing and it was a family affair. "The religious rulers, or priesthood, originated with Seth, the oldest surviving son of Adam and Eve born in the second garden." (UB 849) There are three things you can say about this organization. First, they were priests, religious rulers. Second, they were teachers par excellence. And third, they were physicians. I would identify them with the Sumerian apkallu who were above all priests, advisers to the king, bringers of the me, the wisdom of civilization, and as protectors and healers. There is a link to the page The Apkallu at the bottom of this one for more information. "Zoroaster's teachings, as noted above, centered on Ahura Mazda, who is the highest god and alone is worthy of worship. He is, according to the Gathas, the creator of heaven and earth; i.e., of the material and the spiritual world. He is the source of the alternation of light and darkness, the sovereign lawgiver, and the very center of nature, as well as the originator of the moral order and judge of the entire world. The conspicuous monotheism of Zoroaster's teaching is apparently disturbed by a pronounced dualism: the Wise Lord has an opponent, Ahriman, who embodies the principle of evil, and whose followers, having freely chosen him, also are evil. This ethical dualism is rooted in the Zoroastrian cosmology. He taught that in the beginning there was a meeting of the two spirits, who were free to choose--in the words of the Gathas--"life or not life." This original choice gave birth to a good and an evil principle. Corresponding to the former is a Kingdom of Justice and Truth; to the latter, the Kingdom of the Lie (Druj), populated by the daevas, the evil spirits (originally prominent old Indo-Iranian gods). Monotheism, however, prevails over the cosmogonic and ethical dualism because Ahura Mazda is father of both spirits, who were divided into the two opposed principles only through their choice and decision. The Wise Lord, together with the amesha spentas, will at last vanquish the spirit of evil: this message, implying the end of the cosmic and ethical dualism, seems to constitute Zoroaster's main religious reform. His monotheistic solution resolves the old strict dualism. The dualist principle, however, reappears in an acute form in a later period, after Zoroaster. It is achieved only at the expense of Ahura Mazda, by then called Ohrmazd, who is brought down to the level of his opponent, Ahriman. At the beginning of time, the world was divided into the dominion of the good and of the evil. Between these, each man is bound to decide. He is free and must choose either the Wise Lord and his rule or Ahriman, the Lie. The same is true of the spiritual beings, who are good or bad according to their choices. From man's freedom of decision it follows that he is finally responsible for his fate. Through his good deeds, the righteous person (ashavan) earns an everlasting reward, namely integrity and immortality. He who opts for the lie is condemned by his own conscience as well as by the judgment of the Wise Lord and must expect to continue in the most miserable form of existence, one more or less corresponding to the Christian concept of hell. According to Avestan belief, there is no reversal and no deviation possible once a man has made his decision. Thus, the world is divided into two hostile blocks, whose members represent two warring dominions. On the side of the Wise Lord are the settled herdsmen or farmers, caring for their cattle and living in a definite social order. The follower of the Lie (Druj) is a thieving nomad, an enemy of orderly agriculture and animal husbandry." I believe that the above teachings have a definite Sethite influence and that these religious beliefs had an impact on those long ago Jews who were held captive in Babylon and set free as a result of Cyrus the Persian king. More on Zoroastrian influence on Judaism and Christianity can be found on the page Lucifer. The above quote is from a supporter to the Grail King theory which involves the story of the Merovingians. As a matter of record this web site does not support the Grail King theory but read what is said on this matter and judge for yourself. In Genesis 3:23 "...the Lord God sent him forth from the garden of Eden, to till the ground from which he was taken." And Genesis 4:2 "...Now Abel was a keeper of sheep, and Cain a tiller of the ground." Within the span of only several sentences the Bible says the arts of animal husbandry and agriculture were known to Adam and Eve and their children. This certainly predates the Neolithic revolution by a huge time frame. But the Bible is accurate in that the Edenites did know these arts although they were not the first humans which can be attested by Cain going to the Land of Nod and finding a wife or "the mark of Cain" put on him to protect him from harm by others. (In the Genesis account it was after God told Cain he was to become a "fugitive and a wanderer on the Earth" that "...the Lord put a mark on Cain." This was done in response to Cain's lament in Genesis 4:14 - "Behold, thou hast driven me out this day from the face of the earth; and from thy face shall I be hid; and I shall be a fugitive and a vagabond in the earth; and it shall come to pass, that every one that findeth me shall slay me." "Then Cain went away from the presence of the Lord, and dwelt in the land of Nod, east of Eden"). When I was doing further reading on the subject of Eden I came across this quote: "Cain married Remona, his distant cousin, and their son, Enoch, became the head of the Elamite Nodites." (UB 848) Elam and Sumeria had ties with one another. They were trading partners and shared loosely a Nodite culture. Later they would share the same language as the Babylonians. Its a situation where, at this time, you have the Garden of Eden to the north and a Nodite source from one very close to the Garden to the east. Granted the times of Enoch were well before the Sumerians but these were a people who held tenaciously to tradition. Both the Nodites and Sumerians revered their long past heritage. We have Enoch, more of an Adamite by birth but a Nodite by culture, who has a very intimate knowledge of all that went on that led to the tragic default living in close proximity. Looking at how close Babylon and Elam were it is easy for me to see that the story of Enoch made its way back to Babylon which then was eventually carried with the Jews released from seventy years of exile by the Persian king Cyrus and written in Aramaic upon their return to Judea. Aramaic was the language of Babylon at that time. Although there are no Aramaic copies of Enoch in extent there is a small portion of it in the Dead Sea Scrolls and it is written in Aramaic. In the Bible Enoch is the son of Jared in whose time the Watchers descended upon Mount Herman. "When Jared had lived a hundred and sixty two years he became the father of Enoch" (Gen.5:18). "And they were in all two hundred; who descended in the days of Jared on the summit of Mount Hermon, and they called it Mount Hermon, because they had sworn and bound themselves by mutual imprecations upon it." (1 Enoch 6:6-7). (This statement also occurs in the Book of Jubilees and The Second Book of Adam and Eve.) Jared is from the Sethite list and Cain is from the Cainite list. There are two lists because there are two sources, the Priestly (Sethite) and the Jahwist (Cainite). The Book of Enoch was very popular in its day. Jude, brother of Jesus, quotes it although it is not in the Bible and he attributes it to the Sethite Enoch. The Book of Enoch was banned at the Council of Laodicea. It has been considered as apocryphal ever since. Except by the Ethiopian Church. There is a connection between Enoch and Zoroaster. "I would like to suggest, based on the course of this paper's argument, that an assimilation (at some point in the exegetical process) of two culture-heros has in fact transpired; namely, between Enoch and Zoroaster. I suggest this despite my realization that nowhere in the extent literary traditions is such an identification explicitly given. The reasons for offering this correlation are based by and large upon the popular Hellenistic image of the Persian prophet, facets of which do not cohere with authentic Iranian traditions. First, one of Zoroaster's primary accomplishments (according to Western interpreters) was his discovery and development of astrology. Certain Jewish circles attribute the same discovery to Enoch. Secondly, Zoroaster participated in tours of the supernal and nether worlds; Enoch of course shares these ascension experiences. Thirdly, there are persistent traditions that Zoroaster was temporarily or periodically sequestered from mortal company. One might compare the similarly mysterious occultation of Enoch related in Gen. 5.24 and its dependent traditions." Even the Sumerians have traces of Enoch. In the Kings List Enmeduranna of Sippar seventh of the antediluvian kings is an Enochian candidate. "The Sethite genealogy may also be connected to the Sumerian King List. Evidence for this include the solar symbolism of the seventh figure on each list (the Sumerian king Enmeduranna sharing his name with the city where worship of the sun god was focused, Enoch living 365 years). Like Enoch, Enmeduranna's advisor Utuabzu ascended to heaven." (http://en.wikipedia.org/wiki/Generations_of_Adam) This Sumerian king in sharing his name with his city is what the Bible has to say about Cain and Enoch. "Cain knew his wife, and she conceived and bore Enoch; and he built a city, and called the name of the city after the name of his son, Enoch." (Gen. 4:17) Enoch is also associated with Adapa. They both ascend to heaven and while there both are anointed. It is in 2 Enoch the Slavonic version in which Enoch is anointed with oil. "Utuabzu ascended to heaven" is a reference to the apkallu advisor to Enmeduranna and as we see above, this list of Sumerian antediluvian kings are related the to the Sethite lineage from the time of Adam. The apkallu are related to the Sethite priests (they are symbolically the Sethite priests) but are not considered in this way by academia. In fact, the academics are not sure of who the apkallu really are. However, some do make a connection to the Sethite priests. "The final connection links not with Enmeduranki, but with a fish-man (apkallu), with which each of the first seven kings associated and from whom they learnt all kinds of knowledge. Enmeduranki's apkallu, called Utu'abzu, is mentioned in another cuneiform text, where he is said to have ascended to heaven. This last link remains provisional, but at all events, the writer of Genesis 5:21-24 appears to either have created Enoch as a counterpart of Enmeduranki or, equally probably, to have alluded to an already existing Jewish tradition about Enoch, already modeled on the earlier figure." As you may have noticed Gen 5:18 and Gen 4:17 attribute different fathers for Enoch. This is due to different writers contributing material to the Pentateuch (of which there are four sources) and thus the discrepancy for the father. But it is more than that, it is two different traditions involving competing histories and that extend well beyond this discussion. There is an oddity here. Jared was from the time of the arrival of the Watchers. No such reference is made to Cain although both names for the father of Enoch share the same history. It is ironic that Cain's father according to the Urantia Book was a Nodite - a Nephilim - a new race of men sired by the Watchers. That fact may help to explain why the Book of Enoch, 1 Enoch, contains such detailed information on the Lucifer Rebellion. Enoch would have gotten that story from his father. In real time Cain/Jared would have been from an era well after the time of the Watchers. Lost in the passage of time is the reason for the link-back to the Watchers of Enoch's genealogy. Cain certainly was connected to the Watchers via his father. In the end the real reason for that piece of information to have survived is as mysterious as Enoch himself. the J narrative of the Jahwist for Cain and the P narrative of the Priestly source for Seth. "There can be little doubt that both lists, J’s (4:17-24) and P’s (5:1-32), are fictional and were heavily influenced by Mesopotamian literary traditions. Both the lists of antediluvian patriarchs in Genesis 5:1-32 and the Sumerian Kings List express, in mythical terms, how the life-span of man was drastically reduced after the flood, and both sources list ten antediluvian figures who live mythically long lives prior to each account’s flood narrative. This is dramatized considerably more in the Sumerian Kings List where we have kings reigning for twenty to seventy thousand year periods prior to the flood. Obviously we are in the realm of myth, not historical data, and the biblical scribes were well aware of this fact." "If one were to read these two texts separately, as they once existed, J’s and P’s unique features and emphases would be more easily discernable. As it happens, however, these two texts were redacted together by later scribes, most likely in an effort to preserve both of these textual traditions. It is important to keep in mind that these accounts are not historical, nor even imagined to be historical by our writers. They are narratives whose purpose was to explain the origins and identity of a people as perceived through the writer’s own worldview or the particular elitist guild to which he belonged. Originally the Priestly writer, disagreeing with the earlier Yahwist version or finding that it did not suit his purposes or accord with his perception of the world, took upon him to “re-write” and most likely replace (!) this version of primeval history and craft a new one that better reflected his own theological agenda, and the needs and concerns of the audience to which his text was originally addressed. At a later point in time, this Priestly version, which was written to replace the early Yahwist text, was nevertheless inserted into the Yahwist text by a redactor. In other words, in a later interpretive endeavor to safeguard both traditions, a redactor strategically inserted the Priestly version into the Yahwist text. This in and of itself reorients the Yahwist text towards the more optimistic tenor of the Priestly writer’s account." These lists betrays two things. First is that the two lists have points of agreement, two Enochs and two Lamechs with similarities between other names such as Methuselah. Some lists also include two Noahs. This indicates the accepted opinion that both derive from a common oral tradition. Second is that it is based on some earlier list, the Sumerian King List. There are enough similarities between the two that it is probable. Concerning all of the above is why I believe it is Enoch from the Yahwist list (because of Cain) that we get the history of the Lucifer rebellion. There were no fallen angels according to the Priestly tradition therefore the true Enoch is not Sethite. Theologians and such believe the two Enochs mentioned from the two lists are in fact separate people. That alone helps to confuse the issue. Things do get strange in these genealogies. The best defense I have read of the Seth lineage is that Cain is not recorded because he is not Adam's son. Abel is not recorded because he had no children. I thought this approach is pretty creative. Besides the similarities between the two lists there is another and that goes back to the Sumerian King List. It has to do with the line of Seth. The topic of the apkallu (discussed further on page: The Apkallu) discusses Seth and his followers and how his tradition became entwined with the King List. Whether this has any bearing in the Cain/Seth genealogies is open to question. Just thought I would mention it. The Urantia Book: The final word is always from the UB. According to it Seth is Adam and Eve's son born in the second garden twenty nine years after Cain. Cain was born on the way to the second garden and is not Adam's son. Also, when the Hebrews were exiled to Babylon they did discover the King List with its story of the flood. At that time they could not trace their bloodline back to Adam and decided that they too would use the antediluvian story and let it all wash away with the flood thereby eliminating the problems with the genealogy. The line of descendants from Noah to Abraham (through Shem), about 400 years, is documented in the Bible. So, whether the Seth lineage to Abraham is correct or not is a matter of belief. The UB does have Enos as Seth's son and Kenan as his grandson. And Seth is the origin of the Sethite priesthood. As alluded to on the Tree of Life page, this "Third Eden" was the location where Adamson and Ratta settled and raised their family. Adamson was the son of Adam and Eve and Ratta a pure line Nodite. It was their offspring that merged with the later appearing Mesopotamian Andites that extended the Andite culture to the east, north and south. This is also important as it shows that pure line Nodites were still living at the time of the Garden. And this means that that there was the probable memory of the ancient rebellion still alive just before the invention of writing. This area was also one of the easternmost old Vanite settlements. Adamson knew of this settlement from the stories he had heard from Van. It was only about twenty years after the establishment of the second garden that Adamson decided to locate this ancient settlement. It would be here that he would meet Ratta and where together they started their family. On page 861 the UB states that Adamson was "the first-born of the violet race of Urantia." That means he is an older half brother to Cain. That does not make Cain second in line. There were many other siblings from the first garden as well. Adam and Eve had a very large family from over the past 100 years that they lived in the first garden. But many of their children after the default decided to become the wards of the Most Highs to live in Edentia. So Adam and Eve were much grieved at the loss of their eldest son as he left on his adventure to find this if not nostalgic perhaps enchanting place he had heard about. The Kopet Dagh area has a quite interesting history. Some connections to this edenic area would be the legend of the two lovers, the legend of the Teutonic Norse Gods, the Goddess Idunna with her golden apples of immortality, the origin of the secondary midwayers (some who would align themselves with Lucifer and become known as evil spirits) and perhaps the birthplace of Zoroaster to the northeast. Then we have the origin of the Andonic race, the Sangik races and the Neanderthals from an area extending from the highlands of India to north and east of the Kopet Dagh and migrating out basically north and west. The Lut desert is located to the south in Iran. The name Lut appears to take on the significance of this area's history as Lut was one of the council of ten who chose rebellion. Iran is in part the "Land of Nod." It seems odd for a Scandinavian legend to extend to the Kopet Dagh area but it seems to have come through the shamanistic traditions of Siberia, Finland and Lapland. But this is more than just a legend for there is terrestrial proof of Asgard and Odin. A quick note about giants: in the Celtic legends the giants seem to have moved up through Germany to Scandinavia and then by sea to Ireland and the British Isles. The Celtic legend just about mirrors the "Odins migration" as seen above. 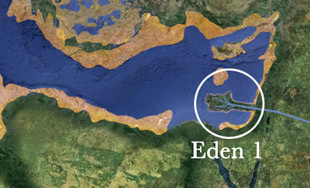 It would not be a long stretch of the imagination to consider Eden to be the long lost Atlantis. As to what has been attributed to Atlantis could be a combination of legends of the first and second garden. The ancient history of the 100 and of Adam and Eve was carried out to the world by the migrating Andites and the stories and oral traditions of these events found their way into the traditions of the cultures of distant lands. But it makes sense that the Garden of Eden would be the genesis of the Atlantis legend. This is the source of the revolution that changed the world. It was the traditions Eden that was the touchstone for civilization. No where on the planet was there anything comparable to its depth of culture, technologies and leadership. 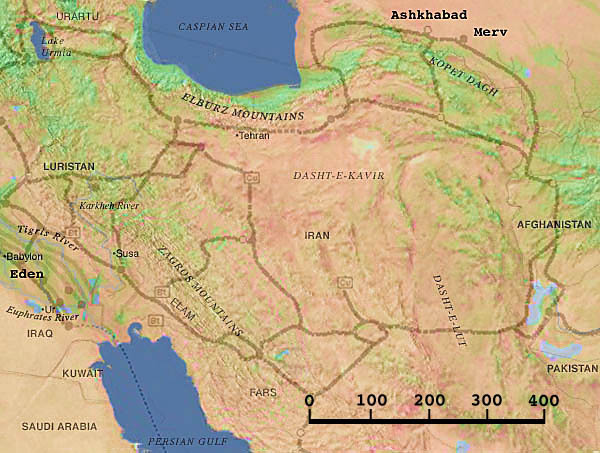 As the techniques of agriculture spread out from the fertile crescent legends followed in its wake. One of those legends was of a paradise of an advanced people and in a great cataclysm disappeared beneath the sea. And so the legend of Atlantis was born. The migration was of a people that carried this legend within their blood. Their ancestors had lived the ancient story. There are several lists of Atlantian features out on the Internet. 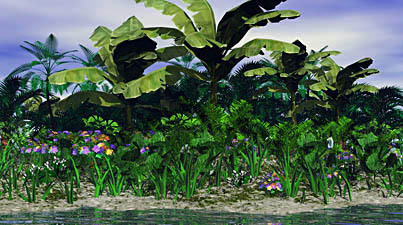 Those items that support the Eden-as-Atlantis would include: irrigation canals, tropical climate, large population, volcanism, sunken continent, superior technology, metals, a plain which contained the capitol city, mountains came down to the sea enclosing the plain, north of the equator, the plain was in a valley, the island’s rivers originated on the highlands, the island provided almost all the requirements for human life and precious stones. The location of the first garden does not fit with Plato's description of where it was situated - in the Atlantic and west of the coast of Africa. But there is an ancient city that has been linked to the mythologies of Atlantis. That city is Tartessos in southern Spain. It was destroyed by a tsunami at the height of it's power. The "Concentric Rings and Channel" may be found on Iberian ceramics but this design is ancient. Neolithic petroglyphs from Scotland, England and elsewhere display what is termed ring cups. These predate the Iberian design by thousands of years. No one really knows what these designs mean but they appear in northern Europe, India, Mesoamerica and the United States. The ring cup to the left is from Scotland and is a drawing of a cup and ring design carved in rock. The number of rings varies in these pertroglyphs and this design sometimes has and sometimes not the so called channel. Some of the channels are really channels that are carved deeper than the rings themselves. Also there are varieties of the cup and ring design which add to the mystery of its meaning. The Tartessian symbol may be the symbol of Atlantis or it could be one of those ancient symbols whose real meaning is lost to us. But the location on the Atlantic seaboard and past the Pillars of Hercules - as stated by Plato - should give us a pause for thought. This is but one of many stories of where Atlantis was located. It is mentioned here because of its connection to the Neolithic enigmatic cup and rings symbol. There as been academic speculation that Dilmun and Eden are the same. They are not. The confusion arises, of course, from the fact that both are called a paradise. Eden was to the north west of Dilmun which was a Nodite city that replaced the destroyed Dalamatia. Technically, the inhabitants of Dilmun were of Nodite heritage and the those of Eden were Adamic. Thus they were two different races. Although the southern Nodites interacted with the inhabitants of the garden there still was a divide between them. "The Sumerians did not have a "unified" Eden myth. Instead they had numerous myths dealing with a place called Dilmun. Just what and where was Dilmun? There seems to have been two such places in Sumerian literature. A mythical paradise-like place and a real geographic local that traded with and paid tribute to various Mesopotamian lands. Most scholars now identify Dilmun with the island of Bahrain. This may well be the case for the later historical Dilmun, but the earlier paradise like Dilmun could not have been there. The only similarity between Genesis and Sumerian myths is that they both have a paradise in the east. The most important theme of Eden is the Trees and the Fall of Man. In fact the whole point of the Genesis tale is the Fall of Man and the introduction of sin and death, not that man was placed in a garden. The Sumerians made no mention of this and a paradise or earlier golden age is common in many religions and cultures. It is obvious to me that the Hebrews did not borrow from the Sumerians." If one reads the ancestral records, Dilmun is where the sun rises which would place it east of the Sumerian city states. To the north the name Eden survived. 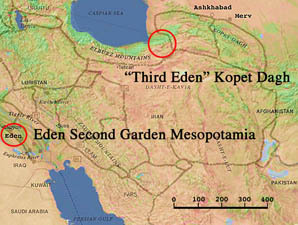 The Sumerians were quite aware of Eden but did not mix very much with them even though as Andites they had Adamic blood. They preferred the culture of the Nodites. 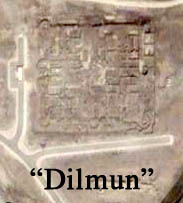 Dilmun is most likely located in Elam but exactly where is unknown. One Sumerian description has Dilmun at the mouth of two bodies of water. The Urantia Book places it to the north and east but near the Persian Gulf, page 858. Just as there were two Gardens there were two Dilmuns. One was in remembrance of Dalamatia and the other as a trading partner which some have designated as Bahrain. There is a small ruined city, just foundations, that has been labeled Dilmun on the northern tip of Bahrain.